Garden Design: Beautiful pool waterfalls idea. 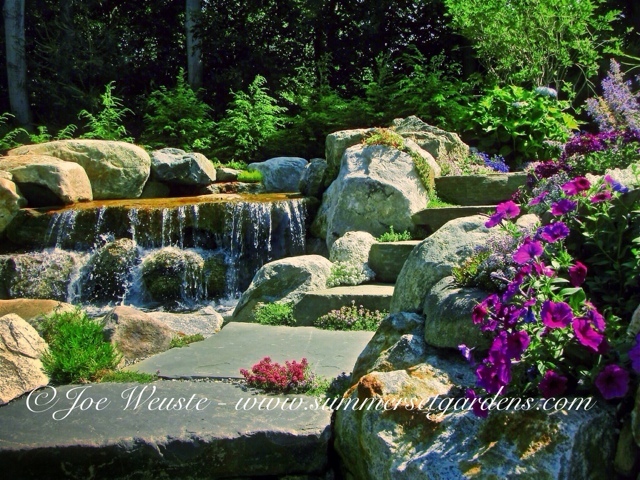 These are the upper falls of a cascading pool waterfall project in NJ. Stone steps follow the falls up to a spa which is out of site. I naturalized the space with a variety of rocks and boulders and planted all the nooks and crannies to soften the stone. I planted Hemlock behind the falls to provide a back drop and disguise the fifteen foot drop behind the falls. Achieving a natural look like this requires on site supervision, careful selection of materials and great attention to details. Swimming pool, landscape architecture design and construction services in the NJ and NY areas.